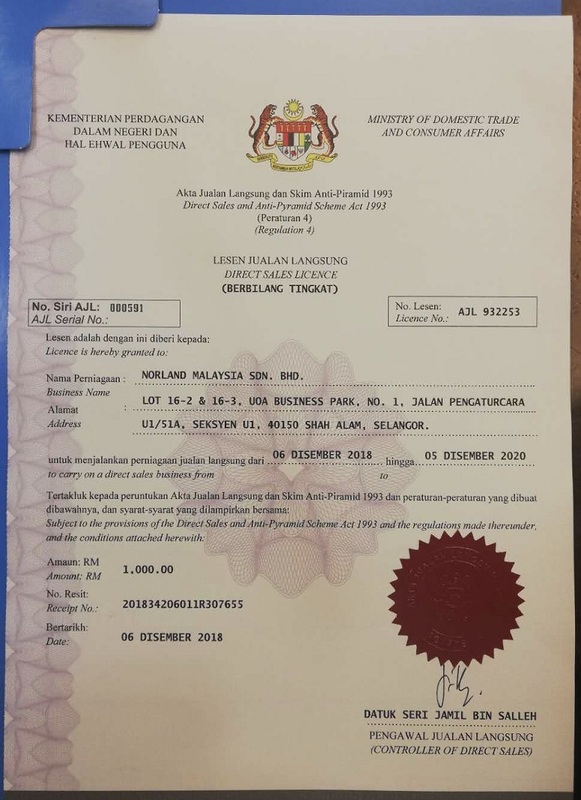 On January 3, the Norland Malaysian branch obtained the Direct Sales License (AJL) from The Domestic Trade and Consumers Affairs Ministry of Malaysia. Norland Group thus accelerated the globalization strategy and further established a healthy ecological matrix based on technological innovation! As we all know, Malaysia has a matured Direct Sales market for nearly 50 years. Currently, the government department in charge of direct sales is the Ministry of Domestic Trade and Consumers Affairs of Malaysia. Malaysia is one of the earliest country that enacted laws to reign in legal Direct Sales and illegal Pyramid schemes. This shows the Malaysian Government’s serious attitude towards the industry. Norland Malaysian Branch relies on the its industrial group's strong strength, aiming at Malaysia's booming big health market and development potential, through continuous innovation and quality service, jointly build a leading health ecological platform, drawing a beautiful blueprint for Norland’s global development. In the future, the Norland Industrial Group will continue to advocate legal Direct Sales, carry out continuous innovation and transcendence, harnessing high-tech resources, strengthen the industrial ecology platform, and serve the world through the Health Industry.